Taoiseach Brian Cowen has won the vote of confidence in his leadership of Fianna Fáil. 71 TDs were eligible to vote in the secret ballot at this evening's meeting of the parliamentary party. The Taoiseach told RTÉ News he was happy with the outcome and said he will lead a party determined to face into the upcoming electoral contest. Mr Cowen said he had no intention of seeking resignations and that his friendship with Michael Martin had not been affected. However Mr Martin, who had opposed the motion, later tendered his resignation as Minister for Foreign Affairs. 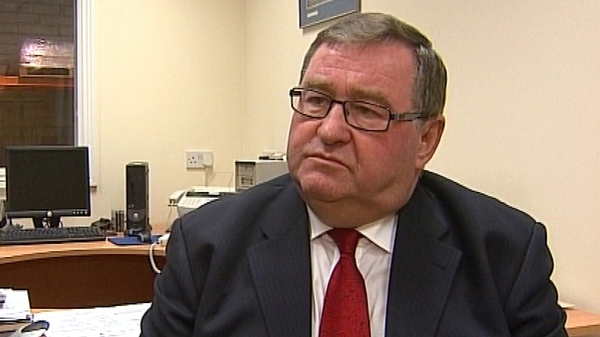 Brian Cowen said he would be reluctantly accepting Mr Martin's resignation. Michael Martin now returns to the backbenches after serving in several ministries - tonight he thanked those he had worked with during that time. After the meeting, Fianna Fáil Chief Whip John Curran insisted the party is united behind its leader. 22.50 David McCullagh: With his wife Mary by his side, the Taoiseach posed for a celebratory photocall tonight at Government Buildings, secure once more in his leadership of Fianna Fáil. The breakdown of the vote wasn't announced, but the official view is that the matter is now closed. 22.01 In a statement, the Green Party said its TDs and Senators had discussed the outcome of the Fianna Fail vote. 2156 Prime Time (watch live here) is reporting that Mary Hanafin voted against Brian Cowen. 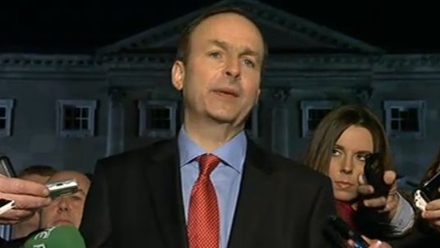 21.40 'One has to make a stand' Micheál Martin tells reporters at Leinster House. Mr Martin said it was an honour to have served in cabinet and he praised those with whom he had worked during his tenure as Minister. He said the party is 'united behind the leader' and Mr Cowen will have the party's full support in the forthcoming general election campaign. 21.29 Taoiseach Brian Cowen tells RTÉ News that he has accepted the resignation of Micheál Martin as Minister for Foreign Affairs. He insisted the leadership issue has not affected his friendship with Micheál Martin. 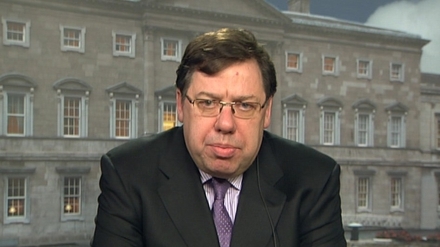 Brian Cowen said he was 'happy' with the confidence shown in him. He thanked Micheal Martin and said he will seek to use his talents in the election. 21.24 Party Whip John Curran says tonight's result and victory for Brian Cowen 'brings an end to this issue'. Mr Curran disagreed that Mr Cowen had been weakened by the leadership issue of recent days. 21.21 Tonight's vote has been welcomed in the Taoiseach's constituency in Co Offaly, says Midlands Correspondent Ciaran Mullooly. 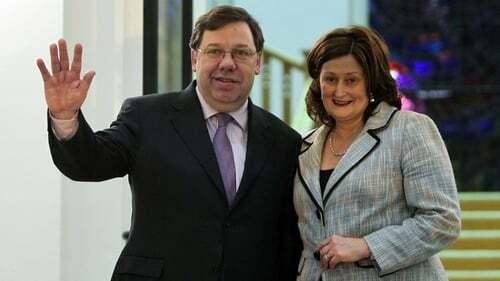 21.10 Brian Cowen wins confidence vote. 21.05 David Davin-Power: Once there is a result it will be delivered by Chief Whip John Curran. 20.55 Micheál Martin is said to have given a strong speech - Mary Hanafin is believed to have given a surprisingly short address to the meeting. 20.53 After more than three hours, and having heard contributions from a range of Fianna Fáil members, the Taoiseach wrapped up the meeting with a speech shortly after 8.40pm. The TDs who are entitled to vote had their names called from a list and cast their votes - one vote, that of Justice Minister Dermot Ahern - was cast from his hospital bed were he is recovering following an operation. The two tellers are Dr Rory O Hanlon and Michael Moynihan; the votes will be shredded after they are counted. 20.52 A result of the secret ballot is expected shortly. 20.48 Voting in the confidence motion is under way. 20.46 David McCullagh: Leinster House has seen plenty of leadership challenges - though tonight's confidence debate seemed relatively civilised. 20.34 The Taoiseach is now speaking ahead of a confidence vote at the meeting. The secret ballot will take some time but a result could come within half an hour. 20.15 It is believed that around 20 members of the party have spoken at tonight's meeting. 19.55 David Davin-Power: About 12 people have spoken now at the Fianna Fáil parliamentary party meeting. 19.25 The Taoiseach spoke for around 20 minutes.